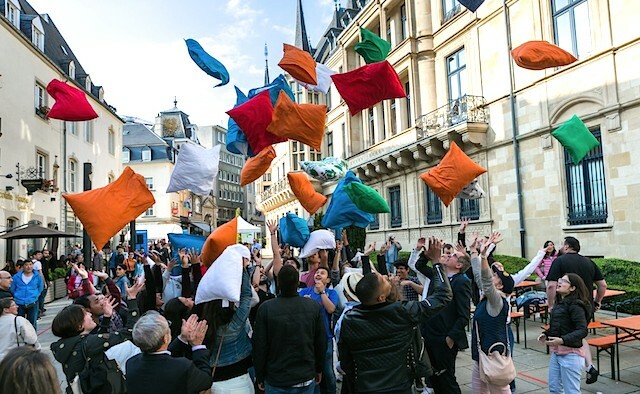 Luxembourgers of all ages met at the Grand Ducal Palace in Luxembourg City last weekend, to take part in a public pillow fight in aid of Parkinson’s awareness. 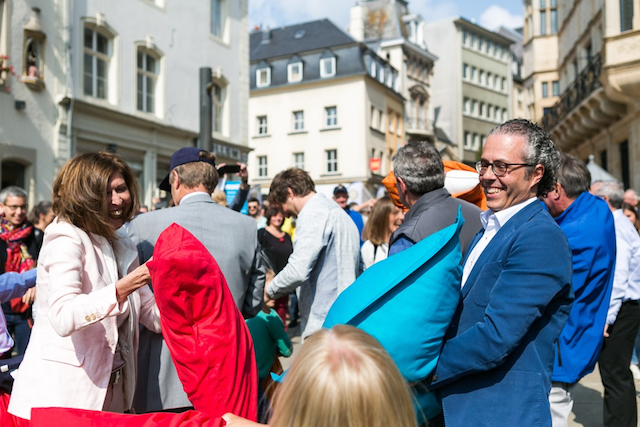 It was a symbol of the fight that many in Luxembourg are waging every day against the condition: people with Parkinson’s, their families, doctors and nurses, researchers and many more. 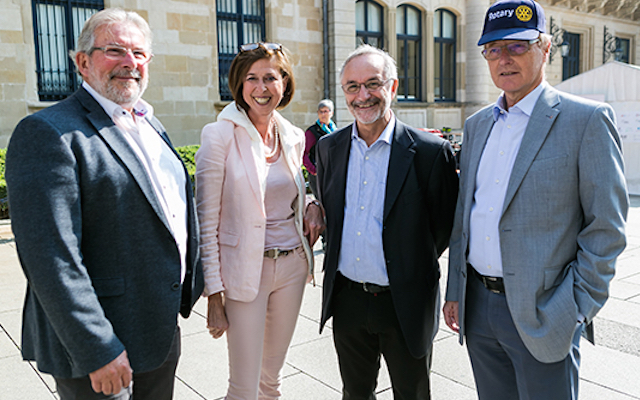 The event’s aim was to raise awareness of the research activities of the National Centre of Excellence in Research on Parkinson’s Disease (NCER-PD), Luxembourg. Co-organised by the Rotary Clubs Luxembourg, NCER-PD and the Luxembourg Centre for Systems Biomedicine (LCSB) of the University of Luxembourg, opening speeches were given by Lydia Mutsch (Luxembourg Ministry of Health), Professor Rudi Balling (director of the Luxembourg Centre for Systems Biomedicine) and Romain Becker (president of Rotary Interclub Luxembourg). 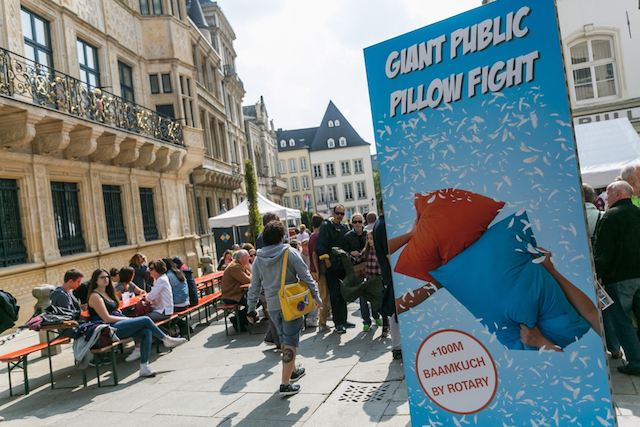 Together, they officially opened proceedings with a pillow fight of their own. Throughout the afternoon visitors could also try on a Parkinson’s suit, which simulates the two most representative motor symptoms of Parkinson’s disease: muscle rigidity and tremors. They were also able to test their dexterity, sense of smell and colour vision, to aid understanding of how the brain controls the senses and movements and why Parkinson’s disease affects these features. The disease can be triggered by any number of different genetic or external factors, and one of the problems in Parkinson’s treatment so far is the lack of patient-specific therapies. NCER-PD is a joint initiative of four partners in Luxembourg: Luxembourg Centre for Systems Biomedicine, Centre Hospitalier de Luxembourg, Integrated Biobank of Luxembourg and Luxembourg Institute of Health, which are uniting their efforts and expertise to develop new methods for the early diagnosis and treatment of Parkinson’s disease. The Luxembourg Parkinson’s study NCER-PD has been funded by the Luxembourg National Research Fund since 2015. The LCSB is a biomedical research centre of the University of Luxembourg. It is accelerating biomedical research by closing the link between systems biology and medical research. Collaboration between biologists, medical doctors, computer scientists, physicists, engineers and mathematicians is offering new insights into complex systems like biological cells, organs, and organisms.